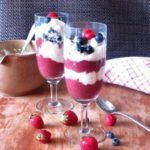 Blueberry Almond Pudding – Fresh berries nestled in creamy almond flavored pudding, with the slight crunch of almond meal. A perfect sugar free dessert. Fruit season is here. After months of apples, and more apples, we finally had some strawberries… and now I have more choices every time I go to Greenmarket. Cherries and blueberries have started to turn up. Peaches are the first stone fruit I’ve seen, but apricots and nectarines follow. Usually we eat them as they are, or over cereal in the morning. And few flavors can beat a really ripe peach, or a bowl of blackberries. Sometimes, though, it is nice to gild the lily – make a real Dessert. As I have mentioned, I don’t eat sugar, and while Rich does, he’s never been that fond of desserts and sweets, and never ate them regularly. But still – it’s nice to have a treat. Now, when I say sugar free, I mean completely unsweetened. I see many “sugar free” recipes that call for honey or maple syrup – but in my body, they are sugar. Others call for agave, or stevia, or other sweeteners of varying degree of artifice – but the sweet taste still triggers the craving for sweet, and I do better without it. Strictly, I should say “no added sugar” because there is natural sugar in the fruit, but… for practical purposes, I call this sugar free. I could just make a plain vanilla pudding and drop in some berries, and that would be good. I like, though, to make something a bit fancier. I lined a bowl with almond meal – not quite a crust, but… and flavored the pudding with almond extract. Take two cups of milk, and pour about a cup and a half into a saucepan. I used a double boiler – it takes longer, and is hotter in hot weather, but I won’t scorch the milk if I am distracted by, oh, taking pictures or something… (This cooking for blogging thing gets tricky, occasionally…) Stir three tablespoons of cornstarch into the remaining cup, and reserve it. Yes, that is more than many pudding recipes call for – this is a bit thicker than most pudding, closer to the consistency of a pie, though not quite that firm. Bring the milk in the saucepan just to a boil (stirring constantly if you don’t use a double boiler!) 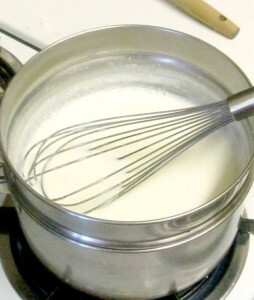 When it comes to a simmer, add the milk with the cornstarch, and stir while it thickens. 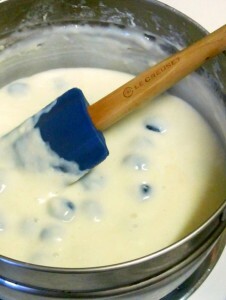 (You can see the thickening milk sticking to the sides of the pan – scrape it down to avoid scorching.) Once it is thick, remove from heat, and stir in 1 teaspoon of vanilla extract and half a teaspoon of almond extract. 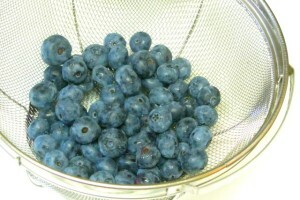 Then add a cup of washed blueberries, and allow it to cool. It is more common to cool the pudding first, but this just barely cooks the berries – softens them, really, and makes them more juicy. Stir them in carefully, as there is a slight chance of breaking. While the pudding and berries cool slightly, prepare the dish. I had almond meal that I ground earlier for another recipe. If you grind it fresh for the pudding, you’ll still have some almond oil on the surface making it slightly sticky – it’s easier to pat that up into something resembling a crust. This was dry – and of course commercial almond meal would be, also – so I just spread it as a layer. Then I carefully poured in the slightly cooled pudding, let it cool to room temperature, and put it in the refrigerator to chill. 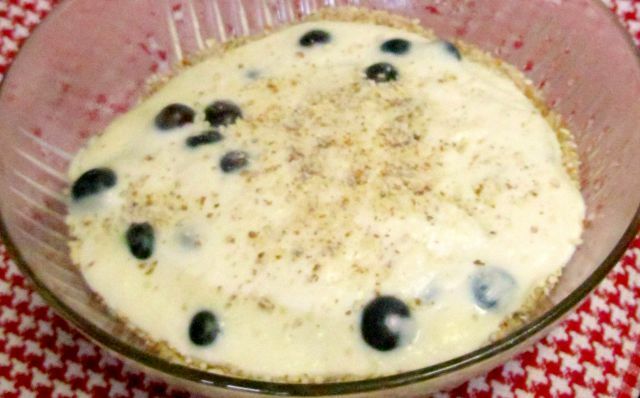 Blueberry Almond Pudding - Fresh berries nestled in creamy almond flavored pudding, with the slight crunch of almond meal. 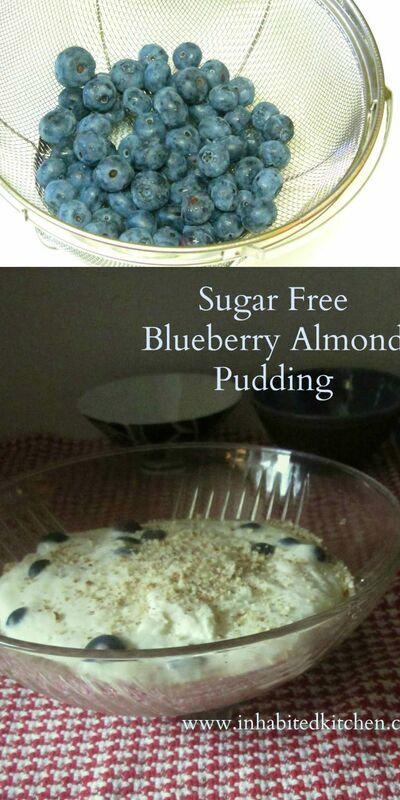 A perfect sugar free dessert. Pour 1 1/2 c of milk into a saucepan. Mix corn starch into remaining milk, reserve. Bring the milk in the pan to a slow boil, stirring constantly. As soon as it starts to simmer, add the milk with cornstarch, stir well, and simmer, stirring constantly, until it thickens. Remove from heat. Stir in the extracts, and then the berries. Set aside to cool slightly. 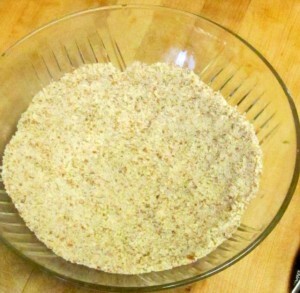 Layer the almond meal on the bottom of a serving dish, spreading out as widely as possible to resemble a crust. Carefully pour the warm berry mixture into the bowl, trying not to disturb the almond meal. Let cool to room temperature, then chill in the refrigerator. 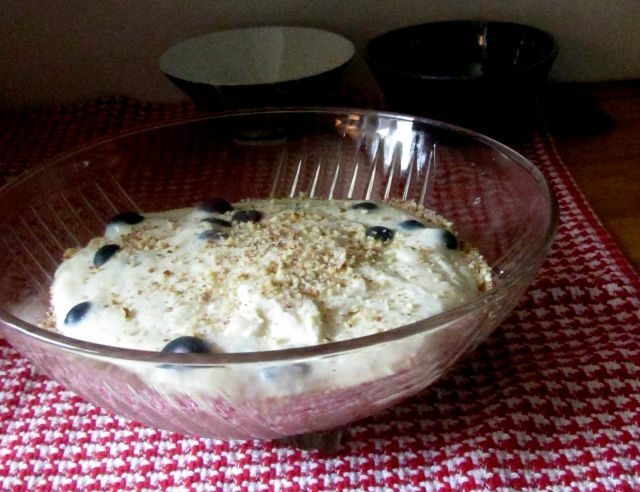 Serve chilled, with garnish of almonds, berries, or whipped cream, if desired. Excellent! Someone who is like me on the sugar front! I hate it when people say something is sugar free when actually it is just refined sugar free! 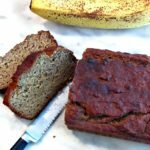 I always specify that my recipes are refined sugar free if they have a sweetener in them! Anyway, wondering what vanilla and almond extract you use? I haven't found an almond one without sugar in...please tell me what you have found!! Great stuff!! Found you on FBC.. BTW I co host a link party with some other bloggers..Its called #SaucySaturdays and we would love for you to join us :) Do hop on to my blog and take a peek.. Thanks!